Update: Access to this has now been blocked. Please see our note here. As TechCrunch reported earlier, there’s a secret iPad version of Facebook’s iOS app hidden inside the currently available iPhone version. Updates below. So, how do you get to it? Well, seeing as it clearly wasn’t designed for public use quite yet, it’s slightly tricky to access, but follow our guide below and you’ll be using it in no time. Having tried the app ourselves, we can say that while a little buggy and occasionally crashing, it’s an incredibly well thought-out way of browsing Facebook. It offers support for just about every part of the Facebook experience (although there’s no video chat) and sits as a good ‘half-way house’ between the compact iPhone app and the full website. 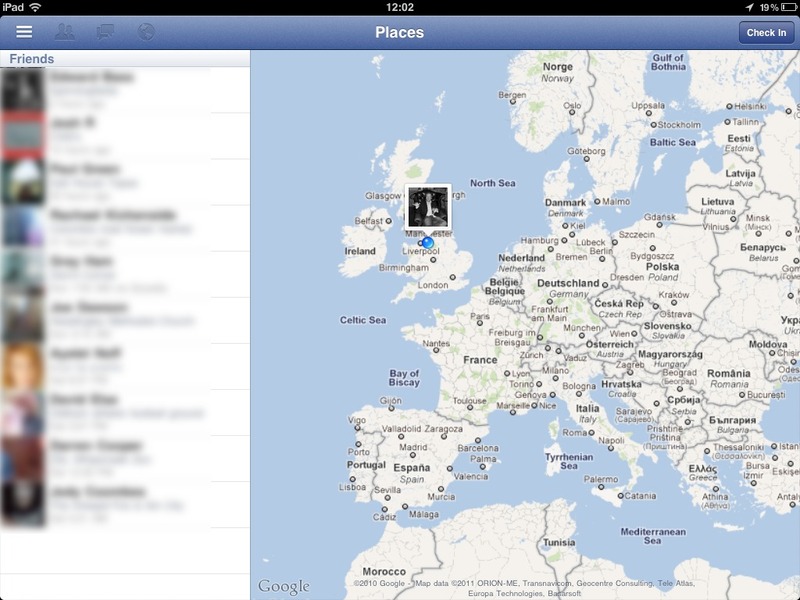 The Places view is particularly nice, showing all your friends on a map. 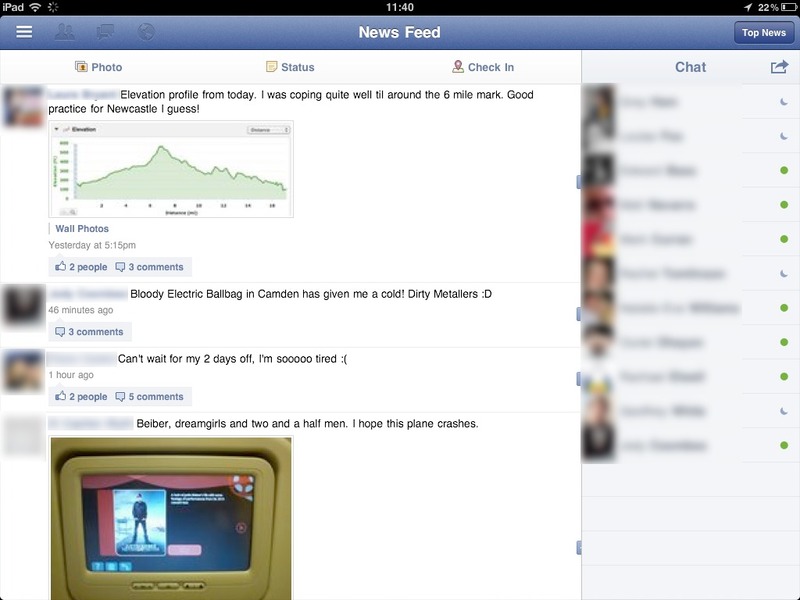 Bugs still to be fixed include Facebook Pages crashing the app and text in certain places not being rendered properly. Still, we can’t wait to try out the finished version once Facebook makes it official. So, how do you get your hands on it? Here’s a step-by-step guide. Please bear in mind that we offer this guide for information purposes only, and you carry out the process at your own risk. 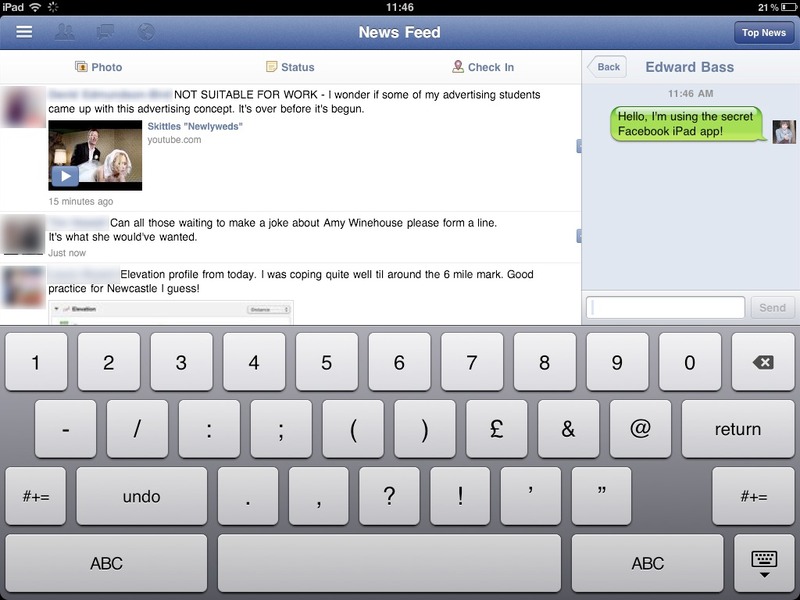 Ensure you’ve got the latest update of Facebook’s iPhone app on your iPad. Jailbreak your iPad. Yes, this is something that not everyone will be happy doing seeing as it’s against Apple’s terms and conditions and you do this at your own risk. However, as we recently reported, JailbreakMe is a really easy way to do it (at the moment) and you can always reverse the process by reverting to your iTunes backup of your device. JailBreaking via JailBreakMe will install the Cydia app store on your iPad. For the purposes of this exercise, it doesn’t matter which version of the App Store you install (you’re given three options aimed at different types of users). In Cydia, search for the iFile app and install it. Open iFile and navigate to var > mobile > applications > directory. Open the iFile settings using the cog wheel icon at the bottom of the screen and switch ‘Application Names’ to ‘on’. This will allow you to see which folders relate to which apps. Find the Facebook folder and open it. 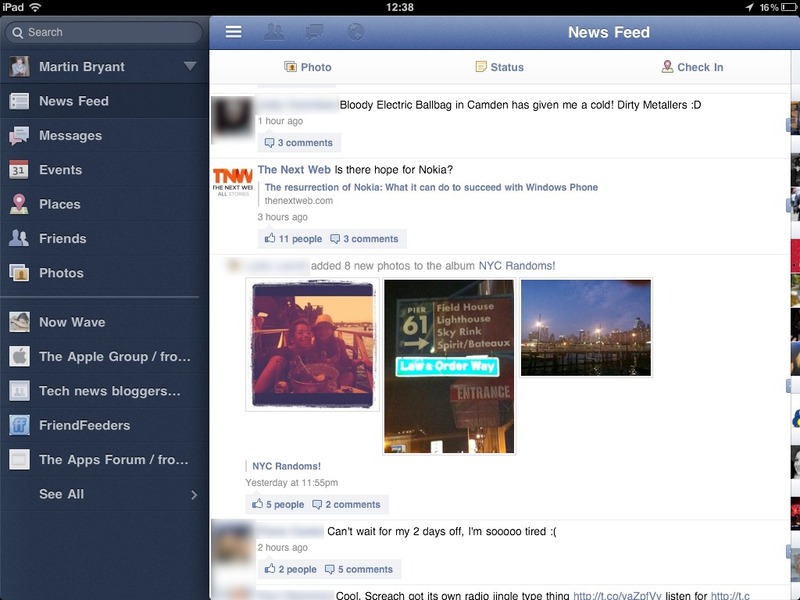 Inside that, open Facebook.app. Find the ‘Info.plist’ file and tap on it. Choose ‘Property List Viewer’. Find the ‘UIDeviceFamily’ option and select it. Change the value here from ‘1’ to ‘2’ and tap ‘Done’. Reboot your iPad and then open the Facebook app. Update: We’ve been getting a lot of reports from users that they are no longer able to log in to the app. 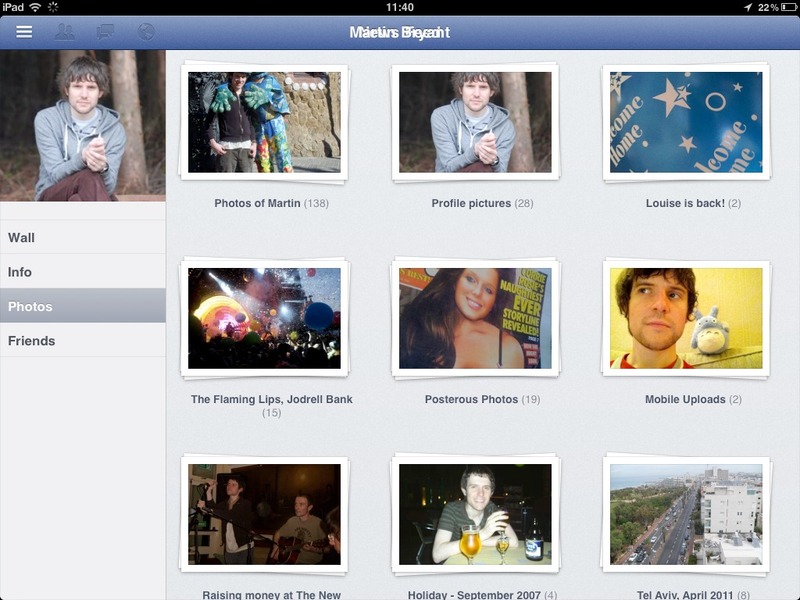 It looks like Facebook has closed the door on the secret Facebook app for iPad. At least until the official version gets released, hopefully sooner rather than later.